One of the most famous companies of China – Xiaomi – does not cease to expand its range and continues to amaze with their innovations users worldwide. The brand is in step with the times and actively promoting the technology “smart house”. Therefore, along with the usual appliances and offers a more modern solution – smart device. One gets the impression that the company intends to flood their devices every segment of the modern food market, from TVs, smartphones and “smart” watches to robot vacuum cleaners, rice cookers, lighting and even kettles. 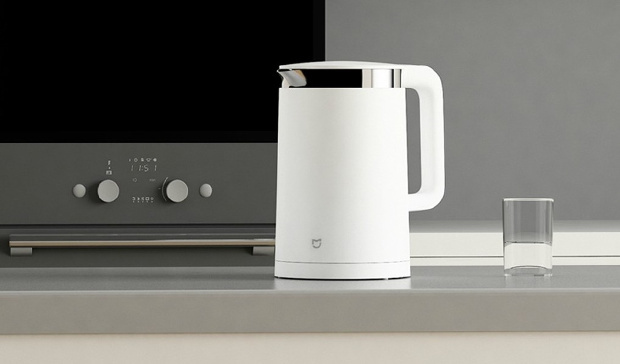 The highlight of today’s review – the “smart” tea Kettle Xiaomi Mijia. We will try to objectively assess his ability to deal with the connection to the smartphone and to identify the strengths and weaknesses of new products from Xiaomi. Whether due to the fact that the company name translates as “grain of rice”, or just because “I’m an artist – I see”, but almost all appliances Xiaomi dressed in white. At that time, as many competitors of “Chinese” tried to cover almost all colors and make your technique to a brighter and colorful, the brand remains true to its have, perhaps, corporate Kohler. Mijia Kettle is no exception, and also received a casing of white plastic with metal edges under the lid. The cylindrical shape of the kettle and straight lines are support designed in the spirit of minimalism. Overall it looks Nordic restrained – nothing more. The top handle has found its place mechanical button to open the lid. The latter has two “modes” of opening: at 45⁰ (for easy pouring) and at 80⁰ (so that the kettle can be washed). Inside the kettle has stainless steel flask 304, which, according to the manufacturer, protects the device from scum and odor. Everything seems simple and clear, but something was missing. Where is the power button? It “hid” from the bottom to the inside of the pen and buttons are actually two. The first kettle is turned on and just boils the water, and the second is to record the temperature. And made them, by the way, touch. But the fun is not in these buttons and remote management. The kettle has a capacity of 1.5 L. We, perhaps more than the usual amount of 1.7 or 2 l, but the difference is not great. For the average “cell of society” with the head missing. The device is quite powerful – 1800 watts. With this indicator, the kettle “extracted” half a liter of boiling water in just 5 minutes. The spiral heating element advanced brands no longer put (today is the destiny of the budget of the dummies), so Xiaomi Mijia Kettle he had hidden the disc. On this disk is a temperature sensor that measures the current water temperature. The error is quite small and is +/- 1-2⁰С. If the technique is stated as “smart”, it simply has to be interfaced with a smartphone. And, in fact, to cope with it. Xiaomi company today already has an army of smart devices that can be controlled with one app – Mi Home. Download app Mi Home is possible and on Androidand iOS. Proceed to “binding” of our kettle. For this we need a smartphone or tablet with the application installed Mi Home and just a few minutes time. Kettle interacts with the device via a Bluetooth connection, so ensure that the smartphone has detected the “new device”, it simply connect to a power outlet. Open the app and we are asked to designate our location. Not a lot of options, and Ukraine to the list of countries still not included, so you can even choose Hong Kong, even the United States. The location can later be changed in the settings. Now autoresume. This is done using Mi account and if You have not yet, you have to make. A matter of minutes. When all settings are ready, click on the ” + ” icon (add device) in the upper right corner and press “Scan” (scan). In the pop-up window that invites us to turn Bluetooth on, select “Turn On” (enable). When appears in the list of our maker, click on it and the app will begin loading elements for its management. In fact that’s all. Now You can simply turn to determine the degree of heat water (40⁰С to 90⁰С in increments of 10⁰С) or choose one of the recommended programs for each drink, as well as to enable or disable a function of temperature. The application displays the current temperature of the water in the kettle. In addition, after switching on the kettle in the application will be simulated boiling water through animation in the form of rising bubbles. Interesting feature – if you watch the water heating through the app, the background color will change gradually. While the water is relatively cold (25⁰С and above), the background will be blue, and the growth of the degrees he will “warm up” and be transformed into pink. Kettles – appliances are potentially dangerous, so no elaborate safety systems (especially in smart devices) anywhere. In Mijia Kettle introduced by the developers? Imagine that You are sitting in the room on the couch and gave the command to his kettle to heat water for tea. Sitting on the couch, You can hardly remember if there’s water in the kettle or not, so if the kettle is empty, it won’t work. Kettle besides disabled when the cover is opened. However, the feasibility of this is not entirely clear, but it is what it is. Stand for kettle and plug designed to minimize the risk of water getting on the contacts. This does not mean that they can be washed under running water, but from accidental spillage will save. The use of two different materials for the casing not only longer retain the temperature of the water (kind of a thermos effect), but also protect user from accidental burn even if the kettle has just boiled. In this case, the outer plastic plays the role of insulation, so after boiling the kettle it is possible to take not only the handle, but even the body. For families that have curious kids, this parameter is important. READ What can the camera SAMSUNG GALAXY S8? Summarizing, we can say that Xiaomi Mijia Kettle is a modern kettle with nice design, decent functionality and reliability. Thus, its price is more than competitive – Mijia Kettle is one of the best offerings on the market of “smart” dummies. For fans of “whimsical” teas, which require strict adherence to the temperature of the brew, this kettle is a godsend – set in the application, the right temperature and brew the beverage according to the rules. This function is good for making baby formula, for which usually need 40-50⁰С. A great advantage of serve and double wall – they hold heat longer, allowing less of it to heat and thus save on electricity bills. However, there is our “newbie” and disadvantages. First – many users will miss in this indicator of water. In order to check the volume of remaining liquid, will always have to open the lid. In a metal flask to make such an indicator is not easy, but it would be possible to consider display of water level in the app. And second, the most important thing is software. Like it or not, but it still needs work. Of course, to cover most languages and countries is difficult, but it’s something to strive for. Although, frankly, doesn’t need to be a native English speaker to understand simple management of the kettle from your smartphone. Probably, the improvement of Annex Mi Home is just a matter of time. You are reading an article on the Overview of “smart” kettle Kettle Xiaomi Mijia. All materials on the site Gadgets F, а также и статья Overview of “smart” kettle Kettle Xiaomi Mijia - written for the purpose of information enrichment and we are happy if you like our magazine.